I’ve taken the theme of these nostalgic 80s and early 90s games, toys, and recording formats and have finally started painting them bigger. I mean huge! Before they were life size in mere inches. Now these pieces are up to 4 feet by 5 feet. They are painted on birch wood and boxed in with redwood siding. I hope to achieve that when people hang them in their office or home that it brightens the mood of the room and of the people who view it. 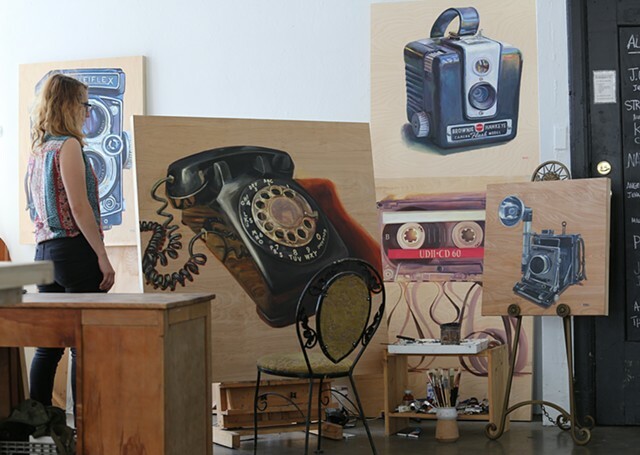 These paintings are so large they are met with contemplating the components that make up the subject Instead of it being a life size object and the viewer seeing it all at once.